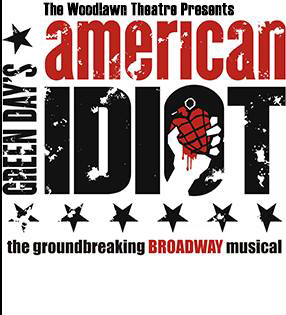 The two-time TONY Award-winning hit musical AMERICAN IDIOT, based on Green Day’s GRAMMY Award-winning multi-platinum album, boldly takes the American musical where it’s never gone before. This high-octane musical tells the story of Johnny, Tunny and Will who struggle to find meaning in a post-9/11 world. The three friends decide to flee the constraints of their hometown for the thrills of city life, but plans are quickly estranged when Will realizes he must stay behind to attend to familial responsibilities, Tunny enters the armed forces, and Johnny’s attention becomes divided by a seductive love interest and a hazardous new friendship. An energy-fueled rock opera, American Idiot, features little dialogue and instead relies on the lyrics from Green Day’s groundbreaking album to execute the story line. Disclaimer: This show features adult content, strong language, drug references, the use of fog, smoke, strobe lights and loud rock music. AMERICAN IDIOT is directed by the Woodlawn Theatre’s executive director, Kurt Wehner. Choreography is by Carla Fey Sankey and Jaime Ramirez is the musical director. GREEN DAY’S AMERICAN IDIOT plays October 2 – November 1 every Friday and Saturday at 7:30 p.m., and Sunday at 3 p.m. Tickets are on sale now at http://www.woodlawntheatre.org, or by calling the box office at 210-267-8388. Prices are $17 for students, $23 for seniors and military, and $26 for adults. Groups of 10 people or more receive a 20% discount. The Woodlawn Theatre is San Antonio’s historic local theatre, located in the heart of the Deco District at 1920 Fredericksburg Road, just south of Hildebrand. Free parking with security patrol is available.